George Galloway has always appeared to inspire a quite remarkable mix of emotions. But whether you admire him, loathe him or lampoon him - never, ever underestimate him. Perhaps it is the holiday home in the Algarve, perhaps it is the fondness for Cuban cigars, but George Galloway seems to get right up the nose of those who count themselves among his critics. Equally, though, he can command an audience with his oratory. And, scattered throughout political life in Scotland, London's East End and Westminster, there are those who have been his acolytes. Born in 1954 in Dundee, Mr Galloway was educated at the city's Harris Academy. After a spell working at the Michelin tyre plant in Dundee, he turned his amateur, youthful passion for Labour politics into a professional career as a party organiser, again in Dundee. His reputation steadily grew - for oratory, for activism and for high-profile controversial campaigns such as the move to twin Dundee with Nablus on the Palestinian West Bank. At 26, he became chairman of Labour in Scotland. Six years later, he was in the House of Commons. To get there, he had to beat no less a figure than Roy Jenkins in Glasgow Hillhead - a seat which had previously been Tory for generations. But always, always the questions. In that same year, 1987, he faced inquiries over his financial stewardship at the charity War on Want, where he had been general secretary for four years. He was exonerated, after volunteering to repay some contested expenses: beyond, he stressed, the repayment required by auditors. Mr Galloway never seems to have aimed for high office. As he noted, marching alongside Sinn Fein's Gerry Adams to campaign against British policy in Ireland did not exactly endear him to the Labour hierarchy. A maverick, a rebel, a dissident: all descriptions which George Galloway detests and disdains. He says such terms imply a "flibbertigibbet" approach to politics, a gadfly attitude to policy. A smile comes easily to Mr Galloway's lips. He can be both charming and affable. But it is occasionally a smile of superiority. 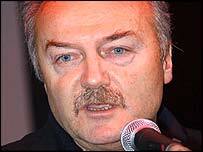 Mr Galloway has denied receiving funds from Iraq. He is talented and he knows it. He has a command of language which provokes envy among more stilted and struggling orators. 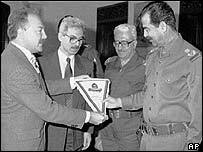 Mr Galloway insisted he was lauding the people of Iraq - not their leader. Few critics were prepared to make the distinction. Then in 1998, he brought little Mariam Hamza to Glasgow for the leukaemia treatment which sanctions prevented in her native Iraq. Supporters said it was an act of charity; critics said it was a cynical PR stunt. Mr Galloway was expelled from the Labour Party in October 2003 in the wake of his outspoken comments on the Iraq war - comments which Labour chairman Ian McCartney said "incited foreign forces to rise up against British troops". Labour acted against him following a number of TV interviews, including one in which he accused Tony Blair and President Bush of acting "like wolves" in invading Iraq. Mr Galloway responded to his expulsion by saying: "This was a politically motivated kangaroo court whose verdict had been written in advance in the best tradition of political show trials." Since his expulsion he has become the figurehead for the anti-war party Respect. In December 2004, Mr Galloway was awarded £150,000 in libel damages from the Daily Telegraph over articles published in April 2003 claiming he had received money from Saddam Hussein's regime. He denied seeking or receiving money from the Iraqi government, saying he had long opposed it. If Labour had hoped that the 2005 general election would see his departure from frontline politics, it was to be disappointed. Instead, he ousted the incumbent Labour MP in Bethnal Green and Bow, Oona King, in what was one of the most remarkable results in modern British electoral history. He polled 15,801 votes, giving him a majority of 823 over King, overturning her previous majority of 10,000. Mr Galloway fought the election on an anti-war ticket, attacking Tony Blair in his acceptance speech. His defeated opponent described it as "one of the dirtiest campaigns we have ever seen in British politics", while he himself described the handling of the election as "a shambles". And his fractious exchanges with Jeremy Paxman in the small hours of election night provided one of the most memorable television moments of the campaign. 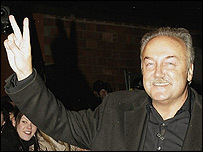 At the start of 2006, Mr Galloway's appearance on reality TV show Celebrity Big Brother introduced him to a whole new generation. It also led to criticism from his constituents, who wondered how he found time to dress up in a leotard and pretend to be a cat in the Big Brother house when he should have been representing them in the House of Commons. He was evicted from the Channel 4 programme on the same day the Daily Telegraph lost its appeal against a £150,000 libel award to the MP. Thanks to his appearance on the show, the media's interest in Galloway's professional and personal life increased dramatically. When he was barred from entering Egypt while on his way to take part in an anti-war event in February last year, Mr Galloway was once again in the spotlight. His latest run-in is related to the Mariam Appeal he and others set up in 1998, after bringing Mariam Hamza to the UK for treatment. He and other trustees were criticised by the Charity Commission last month for failing to make sufficient inquiries into the sources of donations. It found the appeal had received significant donations connected with improper transactions made under the Iraqi oil-for-food programme - but said the money had been spent on humanitarian aid. Mr Galloway said the inquiry had been "politicised". After considering the commissioner's report, the Committee on Standards and Privileges has recommended that Mr Galloway apologise to the House of Commons and be suspended for 18 days. This was the result of his "concealing the true source of Iraqi funding" and "calling into question" the integrity of standards watchdogs. But Mr Galloway said he had been punished for his "robust" defence by "a jury of my political enemies". The controversy, it seems, is not set to end any time soon.